Objective: Periodontitis is known to have multifactorial etiology, involving interplay between environmental, host and microbial factors. The current treatment approaches are aimed at reducing the pathogenic microorganisms. Administration of beneficial bacteria (probiotics) has emerged as a promising concept in the prevention and treatment of periodontitis. Thus, the aim of the present study is to evaluate the efficacy of the local use of probiotics as an adjunct to scaling and root planing (SRP) in the treatment of patients with chronic periodontitis and halitosis. Methods: This is a randomized, placebo-controlled, double-blinded trial involving 32 systemically healthy chronic periodontitis patients. After SRP, the subjects were randomly assigned into the test and control groups. Test group (SRP + probiotics) received subgingival delivery of probiotics and probiotic mouthwash, and control group (SRP + placebo) received subgingival delivery of placebo and placebo mouthwash for 15 days. Plaque index (PI), modified gingival index (MGI), and bleeding index (BI) were assessed at baseline, 1 and 3 months thereafter, whereas probing depth (PD) and clinical attachment level were assessed at baseline and after 3 months. 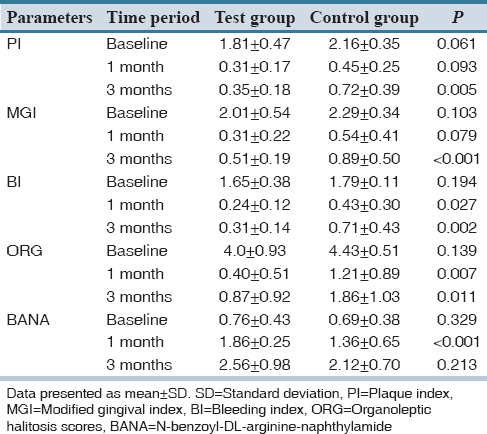 Microbial assessment using N-benzoyl-DL-arginine-naphthylamide (BANA) and halitosis assessment using organoleptic scores (ORG) was done at baseline, 1 and 3 months. Findings: All the clinical and microbiological parameters were significantly reduced in both groups at the end of the study. 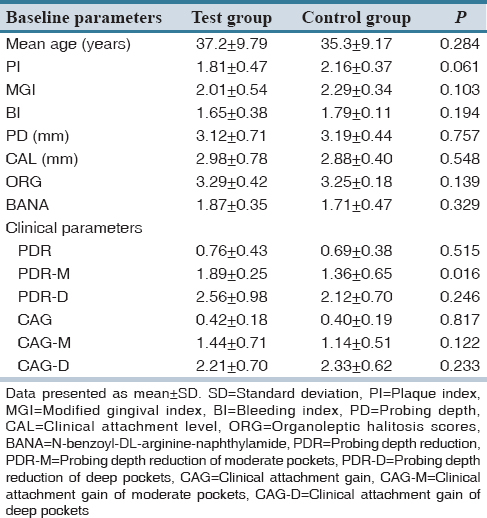 Inter-group comparison of PD reduction (PDR) and clinical attachment gain (CAG) revealed no statistical significance except for PDR in moderate pockets for the test group. Test group has shown statistically significant improvement in PI, MGI, and BI at 3 months compared to control group. Inter-group comparison revealed a significant reduction in BANA in test group at 1 month. ORG were significantly reduced in test group when compared to control group. Conclusion: Within the limitations of the study, the present investigation showed that the adjunctive use of probiotics offers clinical benefit in terms of pocket depth reduction in moderate pockets and reduced oral malodor parameters. Oral malodor, also widely known as halitosis is a problem, which afflicts a large proportion of the adult population, and it is one of the major reasons why many people are motivated to persist with regular oral hygiene. Halitosis is a general term used to describe a foul odor emanating from the oral cavity, in which proteolysis, metabolic products of the desquamating cells, and bacterial purifications are involved. Most commonly used probiotic organisms belong to Lactobacillus and Bifidobacterium genera. Probiotics have been increasingly used in medical field to treat gastrointestinal disorders, respiratory tract infections, etc. Related to dentistry, several studies in the recent years suggest the beneficial effects of probiotics in reducing the caries risk by decreasing the counts of Streptococcus mutans, which is the principal organism responsible for initiation of dental caries. From the periodontal perspective, several studies have revealed the role of probiotic strains in the reduction of gingival inflammation. However, there is paucity in studies, which have investigated the role of probiotics in the treatment of chronic periodontitis and halitosis. Though various studies have evaluated the adjunctive role of probiotics in various forms such as lozenges, chewing gums, or tablets, till date there have been no studies to our knowledge which have evaluated the potential role of probiotic subgingival delivery and probiotic mouthwash on various parameters of periodontal disease and oral malodor. The present study is intended to evaluate the efficacy of local use of probiotic in the form of subgingival delivery and mouthwash as an adjunct to scaling and root planing (SRP) in patients with chronic periodontitis and halitosis and further analyze whether probiotic has an influence on change in the microbial load related to red complex organisms using the N-benzoyl-DL-arginine-naphthylamide (BANA) test. The present study was a randomized, double-blinded, placebo-controlled parallel design study, which was conducted to evaluate the efficacy of the local use of probiotics as an adjunct to SRP in patients with chronic periodontitis and halitosis over a period of 3 months. Systemically healthy patients with the age range of 25-59 years, with a mean age of 45.3 years, who were diagnosed with chronic periodontitis clinically evident with at least 4 teeth showing probing depth (PD) ≥5 mm, clinical attachment level (CAL) ≥4 mm, and with clinically perceptible halitosis were included. Patients with any systemic disease, that could affect the periodontium and likely to alter the progression and course of periodontitis, patients who are on any probiotic supplements, on any antibiotic therapy for the past 3 months, who received any periodontal treatment for the past 6 months, pregnant and lactating females, patients with history of smoking or any other habits, and patients allergic to lactate products and patients who are deemed uncooperative were excluded. Ethical clearance for the study was obtained from the Institutional Ethical Committee of Sri Sai College of Dental Surgery, Vikarabad. The study was conducted in accordance with the principles outlined by the declaration of Helsinki (2000) and good clinical practice. Patients were explained regarding the study procedure, and informed consent was obtained from those who were willing to participate in the study. Using a one-sided type I error of α =0.025, a sample size of 15 patients in each treatment group ensured a power of 80% for a pairwise treatment group comparison with an effect size of 1.06 standard deviation units in an independent samples t-test model. Considering the subjects to loss of follow-up, an attrition rate of 10% was calculated, and two subjects were additionally recruited into the study. All the clinical measurements were recorded by a single examiner. Before beginning the study, intra examination calibration was achieved by taking the recordings on 10 patients 2 times 24 h apart. If measurements at baseline and 24 h were similar to a difference of 1 mm, the calibration was accepted. 48 patients were screened from the outpatient Department of Periodontics, Sri Sai College of Dental Surgery, out of which 32 patients, who met the inclusion criteria, were included in the study. At baseline examination, clinical parameters including PD and CAL were measured at six sites per tooth, plaque index (PI),  modified gingival index (MGI),  and bleeding index (BI)  were recorded. All measurements were performed using the University of North Carolina probe (UNC-15). At baseline, all the patients underwent full-mouth SRP, which was completed within 48 h in 2 sittings. SRP was performed using hand and ultrasonic instruments. After SRP, patients were given instructions regarding oral hygiene maintenance. The patients were then randomized into test and control groups. The test group used probiotic mouthwash for 15 days after SRP and underwent subgingival delivery of probiotic solution at baseline (immediately after SRP), 1 week, 2 weeks, and 4 weeks. The control group received placebo mouthwash and subgingival delivery of placebo. Subjects were asked to refrain from oral activities including eating, drinking, chewing, brushing, and mouth rinsing 2 h prior to each appointment. Subjects remained quiet (abstained from talking) and kept their lips closed for 2 min. They were then asked to exhale through the mouth briefly with a moderate force at a distance of approximately 10 cm from the nose of the evaluator. Organoleptic score (ORG) was estimated on a scale of 0-5  as follows: 0: No odor, 1: Barely noticeable odor, 2: Slightly but clearly noticeable odor, 3: Moderate odor, 4: Strong odor, 5: Extreme foul odor. The threshold level of genuine halitosis was defined as >2, according to the experimental criteria. All the subjects were examined between 10 am and 12 pm ensuring at least a 2 h gap after the morning breakfast. Clinical parameters and microbiological analysis using BANA was done at baseline, 1 month and 3 months. A combination of two probiotic organisms was used in the study which included Lactobacillus salivarius (2 × 10 9 CFU) and Lactobacillus reuteri (2 × 10 9 CFU) per capsule. These organisms were supplied by Unique Biotech laboratories, Hyderabad, in capsule form. The patients were given 28 capsules each and asked to empty the capsule into the 10 ml distilled water and asked to rinse for 1 min, daily twice for 14 days. Randomization was done based on computer generated random numbers by a biostatistician to allocate patients to one of the treatment groups. Probiotic and placebo capsules were provided in identically labeled containers and were given codes as A and B. To ensure allocation concealment, the codes for the patients based on the serial number were maintained by one of the investigators. The same investigator dispensed the probiotic and placebo capsules to the investigator doing all the interventions. The plaque sample was collected from the patient at day 0 (baseline). Sites with deepest PD were selected for plaque collection. The site was isolated with cotton rolls and air dried. Any supragingival plaque was gently removed with curette to ensure that the subgingival plaque sample was not contaminated by supragingival plaque and debris. A sterile Gracey curette was gently inserted into the pocket along the root surface, and care is taken to avoid injury to the gingival tissue and avoid bleeding in the area. The collected sample was streaked over the BANA strip for analysis. Microbial analysis of the plaque sample was done by Perioscan (Ora Tec) reagent strip. The BANA chair side test is used for detecting red complex organisms. Each plaque sample was deposited on the BANA impregnated filter strip, which was at the lower border of the strip and upper reagent strip containing Evans black dye, which was activated by wetting the strip with water or saline. The lower strip was then folded over the upper strip where it would react with Evans black dye showing the color change. The two strips were held together and incubated in a heating block (incubator) for 15 min at about 55°C after which the card is removed, and the degree of color change was assessed as follows: No color change: Zero or negative, Faint blue to black color: One or weak positive, Distinct blue-black color: Two or strong positive. The primary outcome measures were PD reduction (PDR) and clinical attachment gain level (CAG) as well as change in ORG of halitosis and BANA scores from baseline to end of the study. The secondary outcome measures were changed in MGI, BI, and PI from baseline to end of the study. The following statistical tests were employed to analyze the clinical and radiographic parameters using SPSS version 17 software (SPSS Inc, Chicago Illinois, USA). The differences between the test and control group were analyzed according to the mean values of PI, MGI, BI, ORG, PD, CAL, and BANA. The mean PD and CAL per patient were calculated, and the changes in PD and CAL were further evaluated according to the initial values of moderate (4-6 mm) and deep (≥7 mm). A P < 0.05 was considered statistically significant. Intra-group analysis for PD, CAL was done using the student's paired t-test. Inter-group analysis for age, PI, MGI, BI, ORG, PD, CAL, and BANA was done using the independent sample t-test. Intra-group analysis for PI, MGI, BI ORG, and BANA at baseline, 1 month and 3 months was done using the repeated ANOVA test. Out of 32 patients, 29 patients completed 3 months follow-up [Figure 1]. Three patients were lost to follow-up, one in the test group and the rest in the control group as one of the patients did not turn up for further appointments due to time constraints, and others migrated to some other place as mentioned in the study flow chart. Patients of both the group showed uneventful healing and there were no systemic and local complications or any adverse reactions reported during the study. The baseline demographic, clinical, and microbiological characteristics between the test and control group were not statistically significant, indicating that both the test and control were evenly matched at the beginning of the study [Table 1]. Treatment resulted in significant reduction in PD from baseline to 3 months in both groups (P < 0.05), but intergroup comparisons revealed no statistically significant difference in the PDR in the test group. 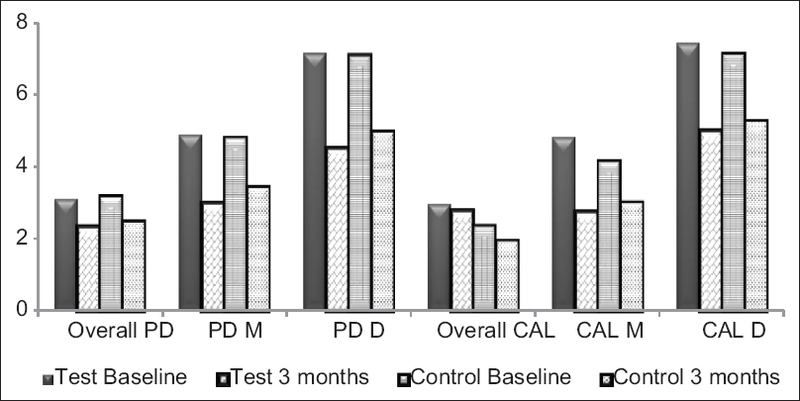 However, test group showed lesser PD at 3 months when compared to control group [Figure 2]. For a comprehensive assessment, PDs were sub-grouped as moderate (4-6 mm) and deep (≥7 mm) pockets. 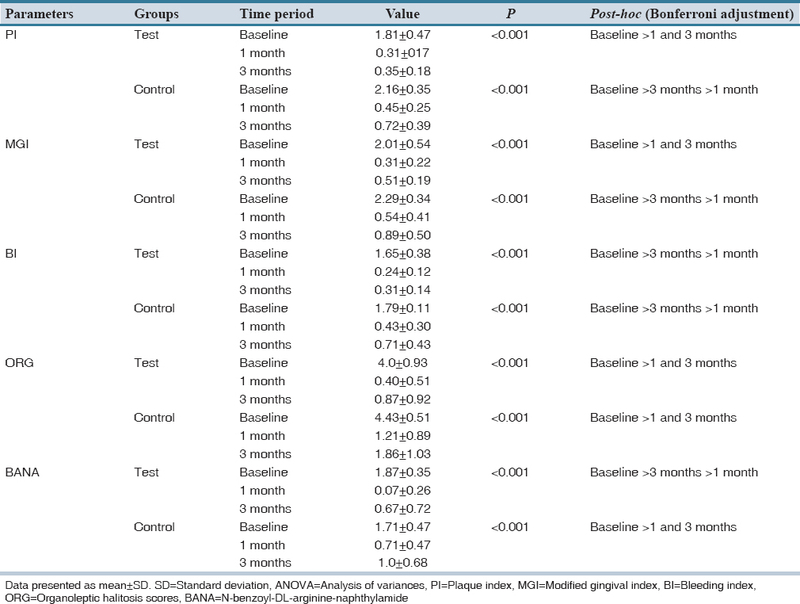 Test group showed statistically significant (P < 0.05) PDR for moderate pockets when compared to control group [Table 1]. Both groups showed significant CAG at 3 months visit when compared to baseline. However, there is no statistical significance when both the groups were compared though test group tend to show more favorable results than the control group. No statistically significant CAG was observed in test group when compared to control, in both moderate and deep pockets [Table 1]. Although both the treatment showed a significant decrease in plaque, gingivitis and bleeding scores, only in few occasions test group showed statistically significant results when compared control group. Both treatment groups showed significant reductions in organoleptic halitosis scores. Intergroup comparison revealed statistically significant reduction in halitosis scores at 1 month and 3 months in test group when compared to placebo [Table 2]. Both groups demonstrated a significant reduction in BANA scores at 1 month, and an increase in BANA scores at 3 months visit. Intergroup comparisons revealed a statistically significant reduction in BANA scores in test group at 1 month when compared to control group [Table 2]. Intra-group analyses of all the clinical parameters between test and control groups are mentioned in [Table 3]. The present study is intended to test the efficacy of probiotics strains L. reuteri and L. salivarius in the form of mouthwash and subgingival delivery in patients with chronic periodontitis and halitosis. In the present study, a combination of Lactobacillus strains were used. It is stated that "no single probiotic bacterium exhibits all the properties, at least not to the extent that it could be a remedy for prevention therapy of all types of diseases" therefore probiotics strains are often used in combination with each other, in order to increase the number of beneficial effects. Both of the strains are proven to be effective in the management of periodontitis ,, and halitosis, , and it is hypothesized that the combination would further enhance the effects. In the present study, adjunctive use of probiotics with SRP resulted in overall PDR and CAG, which are slightly inferior to the findings of Vivekananda et al. and Teughels et al. This can be attributed to the lesser baseline PD and CAL of the present study when compared to previous studies. Further, the former studies used probiotic lozenges for prolonged period, i.e. till the end of the study, whereas the present study used a subgingival delivery 4 times in 4 weeks and a mouthwash preparation for 2 weeks only. The release kinetics of subgingival delivery, mouthwash and lozenges are different, and these factors must have weighed in the form of better results in Vivekananda et al. and Teughels et al. study. Though the mean difference in PD and CAL in moderate and deep pockets from baseline to 3 months was highly significant within the groups, intergroup comparison of PDR and CAG did not reveal any statistical significance except for the PDR in moderate pockets in the test group. These results are in contrary to the findings of Teughels et al.,  where they have achieved a significant PDR and CAG in moderate and deep pockets, after adjunctive use of probiotics in lozenge form for 3 months. This might be due to the fact that the probiotics in their study were delivered throughout the study period (3 months), whereas in the present study, mouthwash was given for only 2 weeks and the subgingival application was done 4 times in 4 weeks. In the present study, adjunctive use of probiotics resulted in significant improvement in plaque scores and gingival parameters (MGI and BI), suggesting the effective role of probiotic mouthwash as an adjunct to SRP. The effect of SRP as a standard means of controlling inflammation seemed to be enhanced by the adjunctive use of probiotics. These results are in accordance with the reported observations of Krasse et al.,  Noordin and Kamin,  Twetman et al. and Vivekananda et al.,  where they have found a significant improvement in gingivitis scores with adjunctive use of probiotics to SRP. In the present study, though the quantitative changes in red complex organisms (Porphyromonas gingivalis, Treponema denticola, and Tannerella forsythia) were not assessed using polymerase chain reaction (PCR) or culture techniques. Instead, the microbial assessment was done with BANA, which qualitatively assesses the red complex bacteria, by means of an enzymatic reaction, represented as a color change on the BANA strip. Both the test and control groups in the present study have shown a significant reduction in BANA scores, and this is due to the decrease in microbial load achieved by means of SRP, which is the standard treatment procedure in disrupting the subgingival microbial environment. The results of the present study are in accordance with the results of Mayanagi et al.,  Iniesta et al.,  and Teughels et al. Though the microbial assessments done in previous studies were more complex and specific (PCR), the present study employing less exacting evaluation in the form of BANA, showed a comparative decrease in microbial load in test group at 1 month. At 3 months, the BANA scores were increased in both the groups and there was no intergroup significance, and this is attributable to the fact that the shift in the microbial composition is only temporary and even when antiseptics and antibiotics are used adjunctively the periodontopathogens recolonize the treated niches quickly. Since the application of probiotic was stopped at 4 weeks and there was no further treatment rendered, recolonization of periodontopathogens must have taken place in due course. In the present study, both the groups showed significant improvement in halitosis parameters as assessed by ORG. Although it lacks objectivity, Organoleptic assessment is the gold standard for evaluating halitosis. Test group showed statistically significant improvement in ORG when compared to placebo. These results are in accordance with the observations of Iwamoto et al. and Keller et al.,  where they have used L. salivarius and L. reuteri probiotics, respectively. The decrease in halitosis scores can be attributed to the decrease in red complex bacteria such as P. gingivalis and T. forsythia, which are the main organisms involved in the production of VSCs. The probiotics used in mouthwash form might have effectively eliminated the pathogenic bacteria from oral niches such as tongue and might have contributed for the better results in the test group when compared to control group. The present study did not show any significant improvements in primary outcome parameters (PDR and CAG) except for PDR in moderate pockets but has shown significant improvement in gingival and microbial parameters and halitosis scores. The possible reasons for this can be attributed to the form and route of probiotic delivery. Probiotics in mouthwash form would have contributed to changes in gingival and halitosis parameters, limited penetration of mouthwash, and limited retention of the subgingivally delivered probiotic solution might be the possible reasons for having no additional benefit in terms of PDR and CAG. Probiotics present a new ray of hope in periodontal therapy. With a proven track record of being safe and effective, scientific advancements in the near future might help evolve a new era of "probiotic soldier bugs". Within the limitations of the study, the present study showed the adjunctive use of probiotics offers clinical benefit in terms of PDR in moderate pockets. The results also demonstrated the beneficial effect of probiotic mouthwash on oral malodor parameters as assessed by ORG. Further research involving a large sample size, longer follow-up, and a more refined subgingival delivery systems (controlled or sustained delivery) and more refined microbial assessment would give further insight into the adjunctive use of probiotics in treating patients with chronic periodontitis and halitosis. Conceived and designed the experiments: SP, BK Performed the experiment in the laboratory: SP, Analyzed the data: KRP, AJ, PK Wrote the first draft of the manuscript: SP, PK Contributed to the writing of the manuscript: SP, PK, AM Agree with manuscript results and conclusions: BVL, RP, BK Made critical revisions and approved final version: AJ, KRP, PK All authors reviewed and approved of the final manuscript. Stamatova I, Meurman JH. Probiotics and periodontal disease. Periodontol 2000 2009;51:141-51. Teughels W, Loozen G, Quirynen M. Do probiotics offer opportunities to manipulate the periodontal oral microbiota? J Clin Periodontol 2011;38 Suppl 11:159-77. Sato H, Ohkushi T, Kaizu T, Tsunoda M, Sato T. A study of the mechanism of halitosis occurrence in periodontal patients. Bull Tokyo Dent Coll 1980;21:271-8. Chapple IL. Periodontal diagnosis and treatment - Where does the future lie? Periodontol 2000 2009;51:9-24. FAO/WHO 2001. Report of Joint FAO/WHO Expert Consultation on Evaluation of Health and Nutritional Properties of Probiotics in Food Including Powder Milk With Live Lactic Acid Bacteria. Cordoba, Argentina; 2001. Available from: http://www.ftp://ftp.fao.org/es/esn/food/wgreport2.pdf. [Last accessed on 2014 Sep 15]. Lobene RR, Weatherford T, Ross NM, Lamm RA, Menaker L. A modified gingival index for use in clinical trials. Clin Prev Dent 1986;8:3-6. Saxton CA, van der Ouderaa FJ. The effect of a dentifrice containing zinc citrate and Triclosan on developing gingivitis. J Periodontal Res 1989;24:75-80. Rosenberg M, McCulloch CA. Measurement of oral malodor: Current methods and future prospects. J Periodontol 1992;63:776-82. Bollen CM, Mongardini C, Papaioannou W, Van Steenberghe D, Quirynen M. The effect of a one-stage full-mouth disinfection on different intra-oral niches. Clinical and microbiological observations. J Clin Periodontol 1998;25:56-66. Bonifait L, Chandad F, Grenier D. Probiotics for oral health: Myth or reality? J Can Dent Assoc 2009;75:585-90. Vivekananda MR, Vandana KL, Bhat KG. Effect of the probiotic Lactobacilli reuteri (Prodentis) in the management of periodontal disease: A preliminary randomized clinical trial. J Oral Microbiol 2010;2:2. Vicario M, Santos A, Violant D, Nart J, Giner L. Clinical changes in periodontal subjects with the probiotic Lactobacillus reuteri Prodentis: A preliminary randomized clinical trial. Acta Odontol Scand 2013;71:813-9. Teughels W, Durukan A, Ozcelik O, Pauwels M, Quirynen M, Haytac MC. 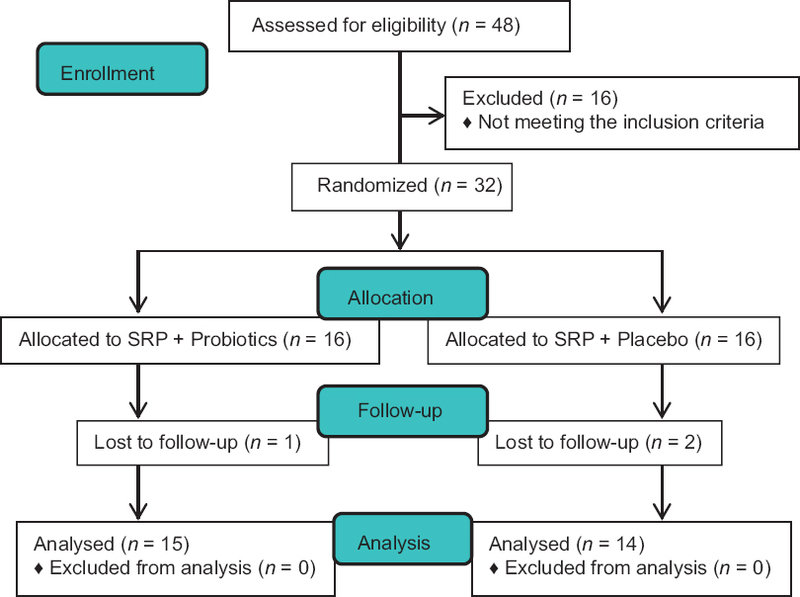 Clinical and microbiological effects of Lactobacillus reuteri probiotics in the treatment of chronic periodontitis: A randomized placebo-controlled study. J Clin Periodontol 2013;40:1025-35. Iwamoto T, Suzuki N, Tanabe K, Takeshita T, Hirofuji T. Effects of probiotic Lactobacillus salivarius WB21 on halitosis and oral health: An open-label pilot trial. Oral Surg Oral Med Oral Pathol Oral Radiol Endod 2010;110:201-8. Keller MK, Bardow A, Jensdottir T, Lykkeaa J, Twetman S. Effect of chewing gums containing the probiotic bacterium Lactobacillus reuteri on oral malodour. Acta Odontol Scand 2012;70:246-50. Krasse P, Carlsson B, Dahl C, Paulsson A, Nilsson A, Sinkiewicz G. Decreased gum bleeding and reduced gingivitis by the probiotic Lactobacillus reuteri. Swed Dent J 2006;30:55-60. Noordin K, Kamin S. The effect of probiotic mouthrinse on plaque and gingival inflammation. Ann Dent Univ Malaya 2007;14:19-25. Twetman S, Derawi B, Keller M, Ekstrand K, Yucel-Lindberg T, Stecksen-Blicks C. Short-term effect of chewing gums containing probiotic Lactobacillus reuteri on the levels of inflammatory mediators in gingival crevicular fluid. Acta Odontol Scand 2009;67:19-24. Teughels W, Newman MG, Coucke W, Haffajee AD, Van Der Mei HC, Haake SK, et al. Guiding periodontal pocket recolonization: A proof of concept. J Dent Res 2007;86:1078-82. Mayanagi G, Kimura M, Nakaya S, Hirata H, Sakamoto M, Benno Y, et al. Probiotic effects of orally administered Lactobacillus salivarius WB21-containing tablets on periodontopathic bacteria: A double-blinded, placebo-controlled, randomized clinical trial. J Clin Periodontol 2009;36:506-13. Iniesta M, Herrera D, Montero E, Zurbriggen M, Matos AR, Marín MJ, et al. Probiotic effects of orally administered Lactobacillus reuteri-containing tablets on the subgingival and salivary microbiota in patients with gingivitis. A randomized clinical trial. J Clin Periodontol 2012;39:736-44.
van Steenberghe D. Breath malodor. Curr Opin Periodontol 1997;4:137-43. 6 Nonsurgical and surgical treatment of periodontitis: how many options for one disease?